LED is used in many microcontrollers based project mostly as the indicator; by applying the right forward bias voltage to this special diode, it will emit the light. Today the used of LED has been tremendously increased not just as the electronic devices indicator but also for replacing the conventional light bulb (e.g. flash light, traffic light, car’s break/sign lamp, etc) and perhaps soon it will replace the fluorescent tube lamp in our house. LED is known to have a very low power consumption, most LED will start to emit a light when we give 2 volt (positive to anode, negative to cathode) and limit the current to 15mA; the key here is to limit the current flow to the LED. Base on this fact we could make a simple LED tester using just one 3 volt micro lithium battery usually found in the pocket calculator. 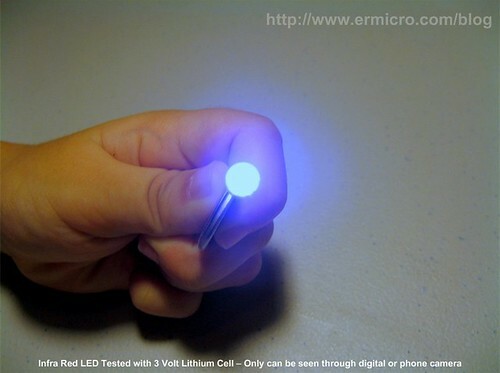 Because this micro 3 volt lithium cell only can supply limited current therefore its save to apply directly to the LED, beside the shape of this lithium battery make it a perfect tools for this purpose. 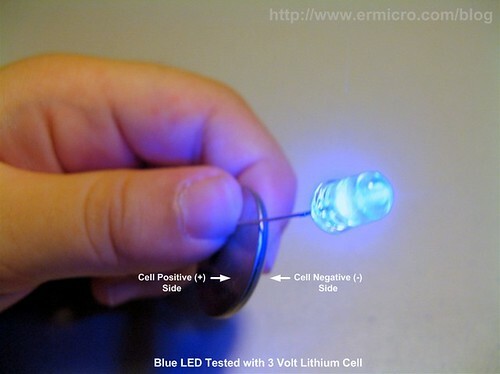 You could see how easy to use this cell to test a LED as shown on this following picture. You could use this lithium cell to test and to find the correct LED’s anode and cathode terminal pins, just by flipping the lithium cell or the LED; if the LED emits the light than you know for sure which one is the anode or the cathode pin. Now just keep this handy and cheap 3 volt lithium battery, who knows you might be use it soon.